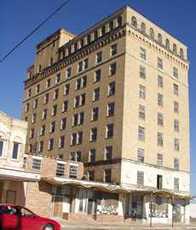 Doering Hotel in Temple, Texas. R - The Doering in 2000. 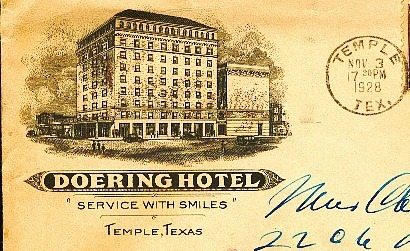 Built in 1928, the Doering was one of Temple's three principal buildings. 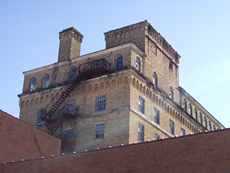 The others were the nearby Hotel Kyle and what had been Professional Building. 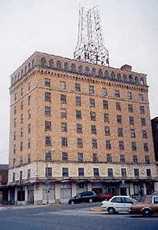 While the Kyle is now in use as a retirement hotel, the Doering has been closed for years. 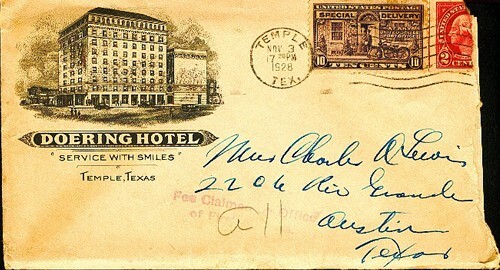 The text of this period postcard gives the Doering's rates as 1.50 to 2.50 for a room with its own bath. Note the Arcadia facade far left. 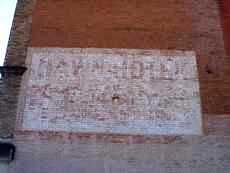 Like many grand and semi-grand hotels, the Doering had a theater close by for the entertainment of guests. 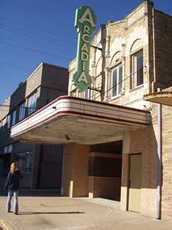 Although the Arcadia Theater was (more or less) a freestanding building, the theater's lobby could be entered from either of two separate street entrances. The theater's minor entrance is to the right of the hotel between the hotel and the windowless building, which is actually the theater. 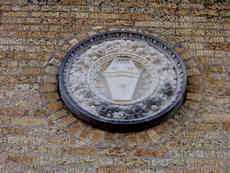 The contemporary photos featured here are courtesy of Sara and Tara Woods of Fort Worth; a mother-daughter team who share an appreciation of old hotels and vintage Texas buildings.